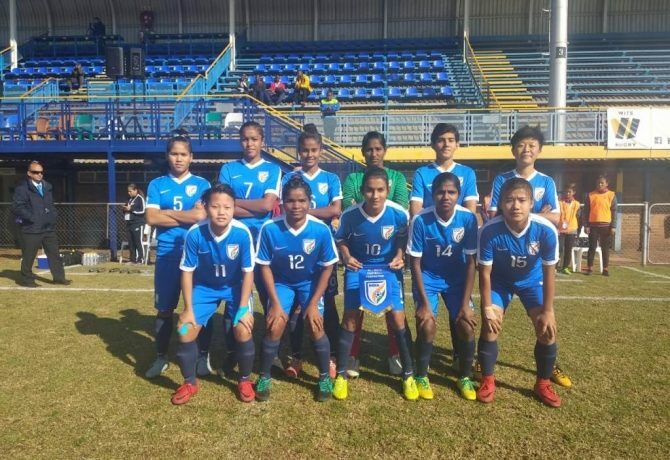 The India U-17 Women’s National Team went down 1-2 against China U-17 in their last match of the BRICS U-17 Football Tournament in Johannesburg, South Africa today, July 22. Two goals by China late in the second half nullified the lead India had taken early on, as the opponents ran out eventual winners. Manisha had put the Indians ahead in the 25th minute when she capitalised on a rebound off a free-kick and her shot went into the net to give India the advantage. The Indian women had a chance to double their lead before half-time in the 42nd minute but failed to make the most out of it as she placed it a bit wide. In the second half, Archana, the Indian custodian made some good saves to keep India in the match but her citadel was breached in the 74th minute when China equalised as they scored, converting from the penalty spot to restore parity and make it 1-1. Eight minutes later, the Chinese girls found the net once again as they scored to take the lead. The Indian girls did go all out but were not able to make it count as the rival defence were able to withstand the onslaught.